Election Day is today. Together our grassroots campaign has worked hard to make San Francisco a more safe and thriving community. As Supervisor, Thea will continue this tireless fight for you at City Hall! Now, it's up to you. 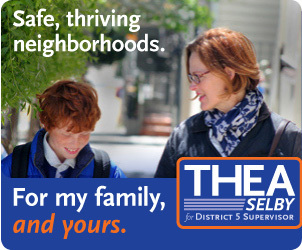 Your choice is clear: Vote Thea Selby for District 5 Supervisor! You can find your polling location here. Join our final push today and stop by our HQ (791 Haight St) or email us. Thanks, we really appreciate your support. Hope to see you tonight at our victory party. GOTV for Thea This Weekend! Election Day is nearly here and we need your help! Join us this weekend at the HQ, 791 Haight St, for our big volunteer mobilization. We'll rally at 10am and enjoy fresh coffee and bagels. Then we'll hit the streets to knock and walk for Thea. Groups will be going out at 11:00am and at 3:00pm on Saturday and Sunday, so you have plenty of opportunities to come pitch in! We only have a few days left, so this is your big opportunity to join Team Thea. Help elect the neighborhood candidate for District 5 Supervisor! 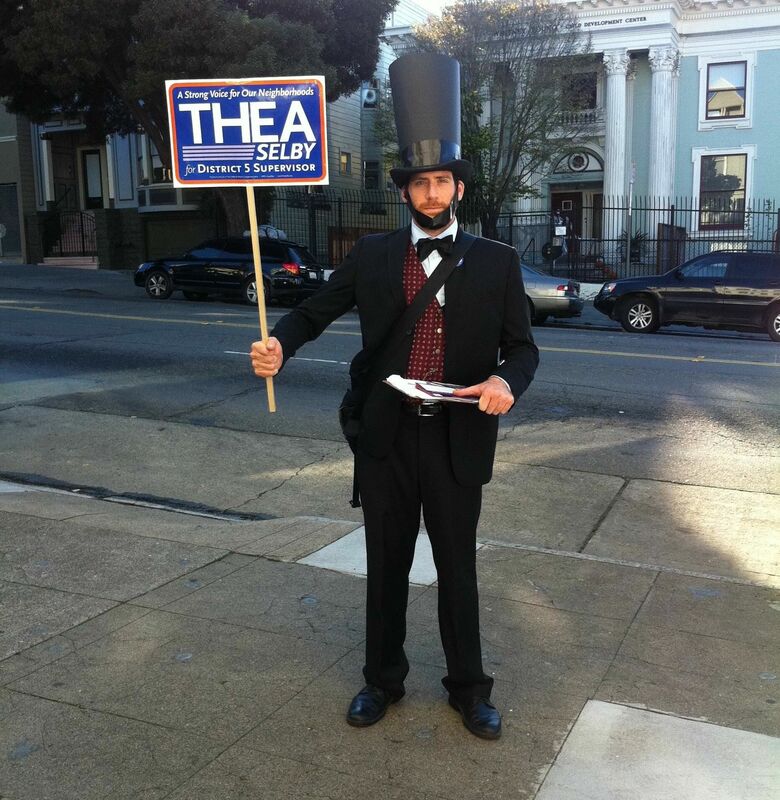 If Honest Abe is supporting Thea, shouldn't you? San Francisco is more than a City, it's our home. Yet our appointed Supervisor and City Hall are missing in action. They want your vote, but have little to show for it. Is housing more affordable? Is our community safer? Would you even recognize them on the street? Our grassroots campaign is not just about votes, it's a hopeful fight for affordable housing, safe neighborhoods, and a thriving community for all. With only 5 days left, you have the power to finally put a neighborhood voice in City Hall -- one that fights for you! Join us Saturday 11am at the HQ (791 Haight St) for our big volunteer mobilization. Breakfast and coffee is on us! We'll also need folks to help leading up to Election Day. Sign-up today. Finally, we want to thank everyone for their tremendous support! Hope to see you this weekend or out in the community. 7 Days to Change Our City! We are only 7 days away from Election Day! Here at Team Thea, we always knew this journey would be tough. Together we've walked communities across District 5 and talked with our neighbors — in all kinds of weather. The response has been amazing and we've listened to all your ideas on how to make our City safe and thriving. Your choice is clear. Ask yourself: when was the last time City Hall or the appointed Supervisor met you face-to-face and listened to your concerns about public safety, affordable housing, and jobs? One question: who can you trust to fight for you? Career politicians and real estate speculators? Or a mom who raises her family in the Lower Haight, keeps her small business running, and knows the fundamental importance of a thriving economy for everyone? 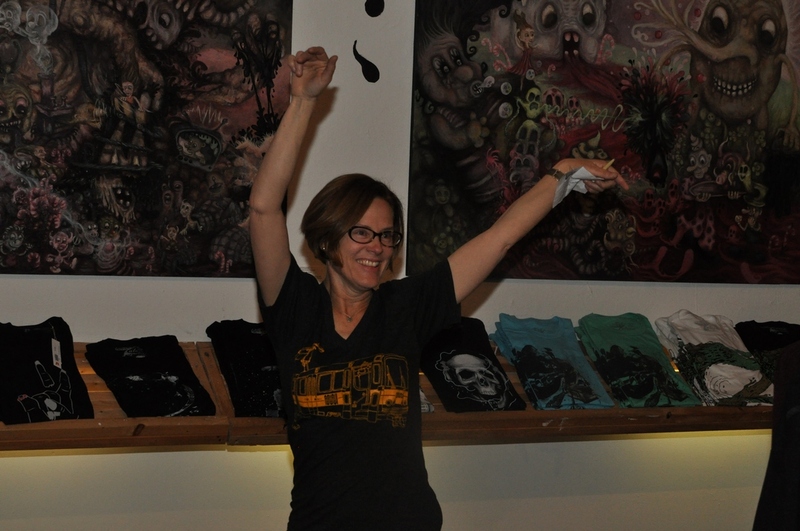 Thea celebrates the big Giants win on Haight St.
You have the power to fundamentally change our City on Election Day. Vote Thea Selby! We need passionate, smart people like yourself to help us in this fight. Join our campaign today! Spread the word, get out the vote, and get your feet on the street and your voice on the phone. Thanks for the support and we'll see you on the campaign trail. With Election Day less than 2 weeks away, I am very grateful and tremendously humbled by the support I’ve received across our community. Our grassroots campaign has received endorsements from major newspapers such as the San Francisco Examiner and San Francisco Bay Guardian. Leading city and state elected officials have also backed my campaign, including Assemblymember Fiona Ma and Supervisor Malia Cohen. And we’ve raised over $100,000 — half of it in donations of $50 or less. Has housing become more affordable? Do you feel safer in your neighborhood? Do you feel you have elected representatives that you know and trust? Do you think your voice counts in City Hall? As Supervisor, my top priority will be working for safe and thriving neighborhoods. I’m not a career politician or a City Hall insider. My grassroots campaign is built on a foundation of strong progressive values, which will never waver in the face of pressure from special interest groups or downtown developers. As Supervisor, I will bring these values to City Hall and work to overcome the recent divisiveness in our City. I hope you will support and join my grassroots campaign today. Two Weeks Away from a Giant Win! These past two weeks have been an exciting one for both our grassroots campaign and San Francisco. Last Thursday we had our very successful Progressive Publishing and Politics fundraiser. This featured David Talbot, author of local bestseller Season of the Witch, Jay Harris, publisher of The American Prospect, Supervisor Malia Cohen, and DCCC Vice-Chair Zoe Dunning. Thank you to everyone who made it out! 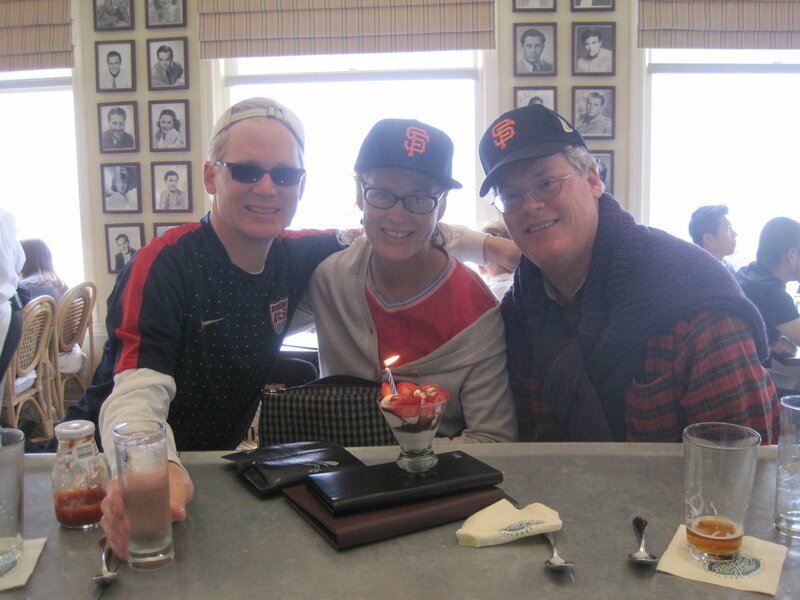 We obviously need to give a big shout-out to our San Francisco Giants! Thea and crew took time from the campaign trail to watch our team take the pennant after overcoming a 3-1 deficit. Once again, the Giants have inspired the City and beyond. Now, on to Detroit! 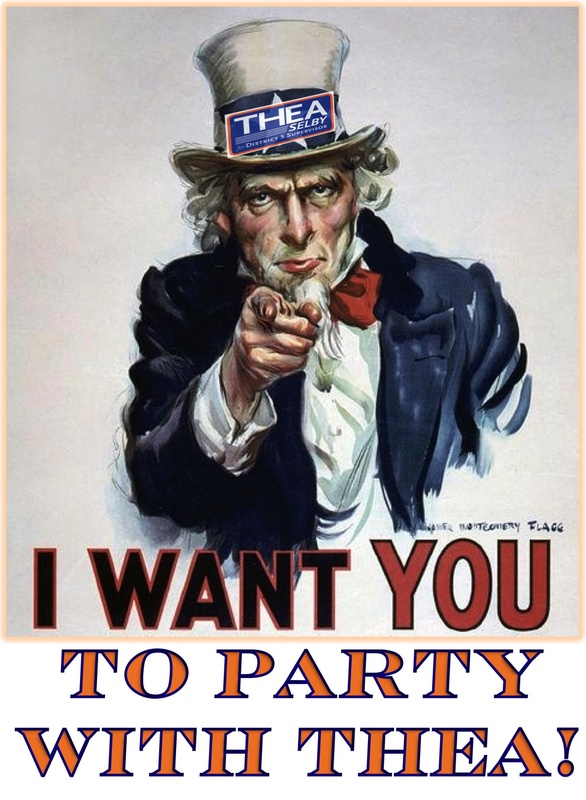 Come out Thursday, October 25th to party with Thea! We want to thank all of our friends and supporters by rocking the Lower Haight with a celebration at D-Structure (520 Haight St). Local DJ Ellen Lovelidge, known as DJ Lil' Elle, and Tom Temprano, AKA DJ Carnita, will be providing music. Did we mention there will be skee ball? 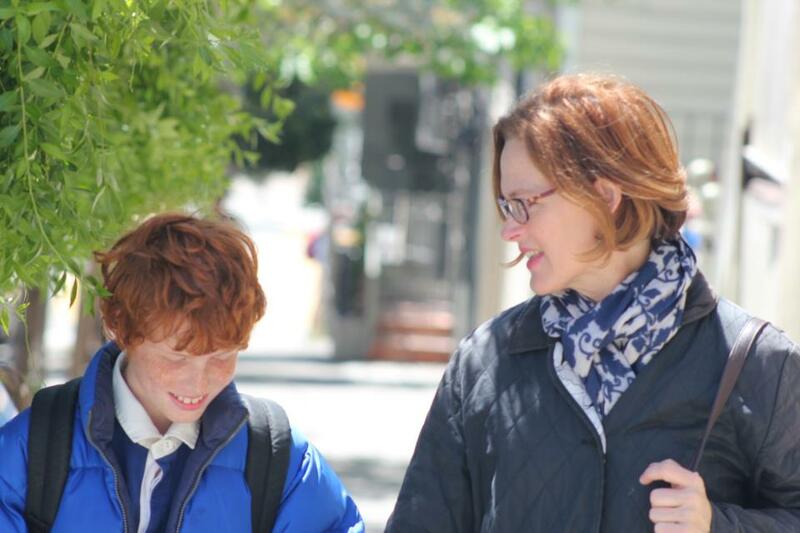 Hang out with the only lady crazy enough to raise her kids in the Lower Haight and run for District Supervisor. At the same time. You heard it. Plus, join our pre-party phone bank 5pm at the HQ (791 Haight St). We'll have pizza and refreshments for you. Hope you can make it! Progressive Publishing and Politics Fundraiser This Week! 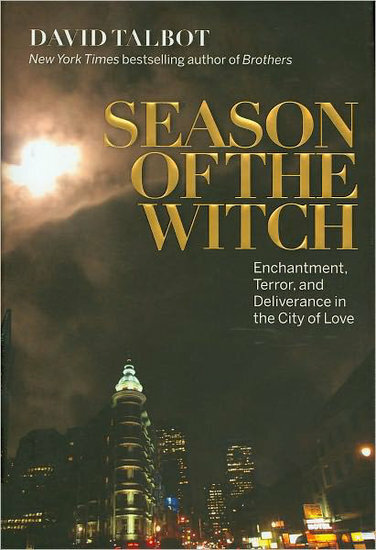 Have you had a chance to read Season of the Witch by David Talbot? It's a local bestseller and fascinating take on SF politics from the 60's to the 80's. Well, we are very excited to have Mr. Talbot, co-founder of Salon.com, join us this week for our big Progressive Publishing and Politics Fundraiser Thursday (10/18) 5:30pm at 1300 on Fillmore. The event will also feature Jay Harris, publisher of The American Prospect and former President and Publisher of Mother Jones, and District 10 Supervisor Malia Cohen. Learn more and purchase tix here. Mr. Talbot will read a selection from his new book and have signed copies available for sale. 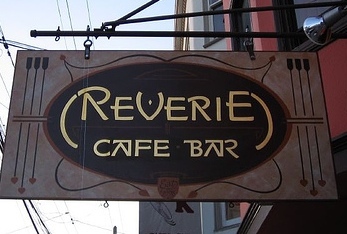 The great folks at Café Reverie (848 Cole St.) are hosting a meet-and-greet for us this Sunday (10/21) at 5pm! Please swing by with your friends, neighbors and family to hear a little bit about Thea's platform. Plus, you can tell her about your experience in the neighborhood. We would love to see you! Have questions? Reach out to our event coordinator Catherine. 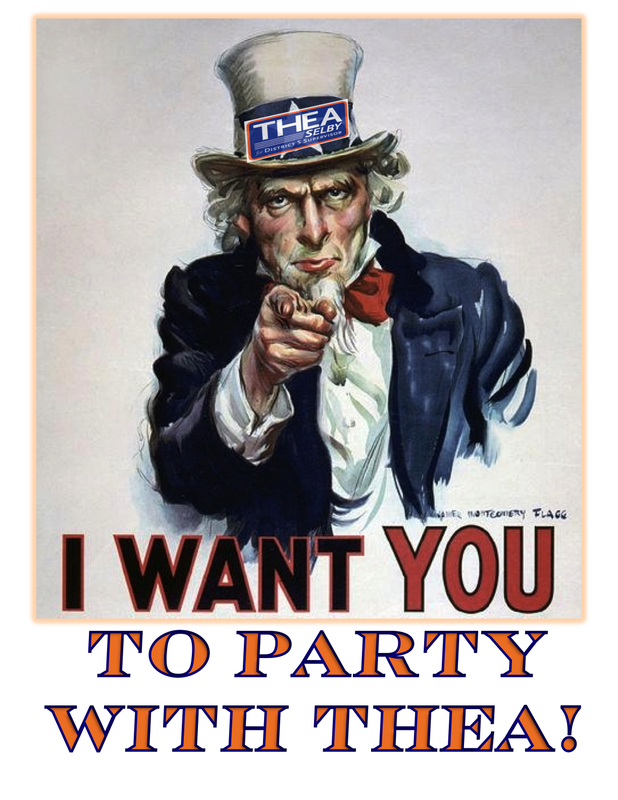 San Francisco Examiner Endorses Thea! "an energetic community activist and organizer as well as a supporter of families and small business in her district... She would arrive at City Hall with a neighborhood-centric viewpoint, but is smart enough to quickly take on a more citywide approach." 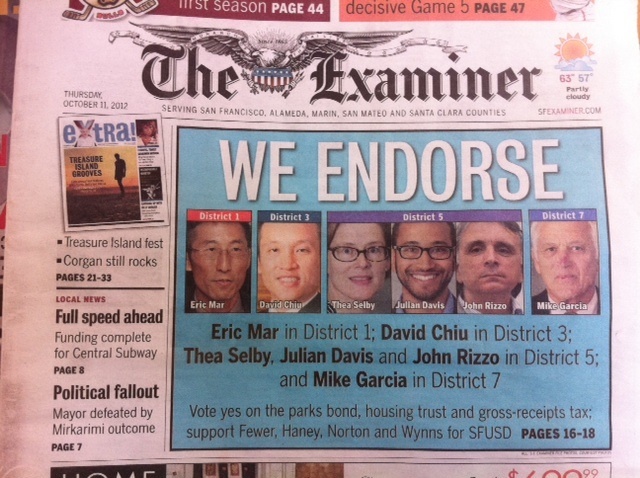 Front and Center: Thea on the Cover of the SF Examiner! 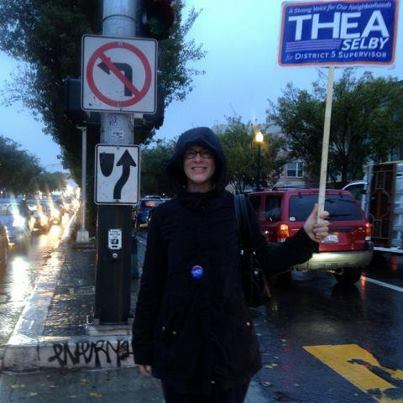 Thea recently also received an endorsement from the San Francisco Bay Guardian, and the San Francisco Chronicle noted: "Thea Selby, active in numerous neighborhood causes, is an appealing voice for small business. She has a future in city politics." Like to talk on the phone? We do phone banking every Tuesday and Thursday from 5:30pm to 8pm. Prefer to walk the neighborhood? We walk Mondays/Fridays at 5:30pm and Saturdays/Sundays at 1pm. Contact our A-M-A-Z-I-N-G Volunteer Coordinator Saudia today! She'lll hook you up! Early Voting Begins, Vote Thea Today! Thea is a mom, small businesswoman, and long-time neighborhood activist. She's committed to creating a safe and thriving district, and to being a strong voice at City Hall for you. The San Francisco Chronicle recently noted that, "Thea Selby, active in numerous neighborhood causes, is an appealing voice for small business. She has a future in city politics." Thea has served our community in many ways. She's been President of the Local Haight Merchant + Neighbor Association, Former VP of the Rosa Parks Elementary PTA, and served on the Executive Board of the San Francisco Transit Riders Union. Thea also enjoys support across our community. She's been proudly endorsed by Assemblymember Fiona Ma, Supervisor Malia Cohen, and DCCC Vice-Chairs Zoe Dunning and Leah Pimentel. Local small business owners have also voiced their support, including Upper Playground and Zahra Saleh of Cafe International. With less than a month till the election, now is the time to join Team Thea. Learn about upcoming events in your neighborhood, volunteer with us, or donate to help fund our grassroots campaign. As always, we'd love to meet you at the campaign HQ (791 Haight St). Stop in, say "hi", and meet our amazing volunteers. We hope to count on your support. See you on the campaign trail soon! A BIG Progressive Endorsement for Thea! On Wednesday, Thea received the endorsement of the San Francisco Bay Guardian, our City's leading progressive newspaper. Thea is a lifelong progressive and thrilled with their support for two reasons. First, the endorsement praises her strength as a neighborhood and small-business advocate. Just as importantly, it's a bold commitment on the part of the Guardian to level the playing field and push for the kind of open race this District so desperately needs. Together we can fight the growing influence of City Hall insiders and downtown development interests. Finally, join us Monday 7pm at our HQ (791 Haight St.) for our big SUPPORTER party! We'll cheer our successes thus far & get pumped for the final month of the race. There'll be music and food! Make sure to bring your friends — the person who brings the most friends will get a prize! Learn more and RSVP here. If you would like to bring a dish, just let Catherine know. Hope you can join us!